Dates: 26-28 September Coverage: Live commentary on BBC Radio 5 live, highlights on BBC Two and live text commentaries on the BBC Sport website each day via desktop, mobile, tablet and app. Tears of pride welled in the eyes of the grand old man of European golf. John Jacobs was sitting opposite his most recent successor as captain of the continent's Ryder Cup team. Now aged 89, the esteemed Jacobs helped Paul McGinley put in perspective the quality of the home team he will be leading in defence of the trophy starting on 26 September. The two men lunched together a month or so before the Irishman's announcement of his three wildcard picks at Wentworth on Tuesday. Jacobs was skipper in the first two matches after the opposition to the USA was expanded from Great Britain and Ireland to the whole of Europe. In both matches the continent was heavily defeated. At The Greenbrier in 1979 the US won 17-11 and two years later at Walton Heath they thrashed Europe by 18½ points to 9½. How times have changed. Later this month Tom Watson, who played in the second of those US victories, brings his side to Scotland as definite underdogs. "I wouldn't say we're hot favourites but we certainly are favourites," McGinley told BBC Sport after announcing his three captain's wildcard picks. "And it is something we should embrace. "Talking to John Jacobs, there's tears in his eyes when he talks about how far European golf and the European Tour have come." One indicator of the current high standards is that McGinley felt able to leave out Luke Donald from his Gleneagles line-up. Europe have won all four Ryder Cups Donald has played and the former world number one claimed 70% of the points he contested. McGinley's choices of Stephen Gallacher, Ian Poulter and Lee Westwood made sense but are not without risk. Gallacher was a shoo-in after his response to the challenge of trying to qualify in Italy last Sunday. The fact he has a dismal matchplay record to date can be disregarded because nothing compares with the atmosphere of Ryder Cup golf. A Scot at a Scottish Ryder Cup is a more important tick in the box, as is the message that there is still room for home-based players in the European team. The selection of the two English stalwarts is more of a gamble. Yes, Poulter is a living Ryder Cup legend but his form is horrible. Of the world's top 50, only the injured Tiger Woods has accrued fewer world ranking points than Poulter this year. Indeed, in the points gained category, Donald beats both of the Englishmen selected ahead of him. So McGinley's picks have not been statistically based choices but ones made with a golfer's instinct allied to the counsel of vice-captains Sam Torrance and Des Smyth. We all know Poulter is a different animal at the Ryder Cup. He inspired the 'Miracle at Medinah' and couldn't be ignored. But, make no mistake, the pressure will be on for a player who has had only two top-10 finishes all year (the most recent in early June). Poulter is also sure to be targeted by the Americans. If they can beat him, they know it can potentially have a bigger effect than just the single point gained. "He's a talisman - you know he's always going to raise himself coming into a Ryder Cup," McGinley said. "He very rarely has a lot of form going into a Ryder Cup, but somehow manages to produce it. "He knows he's up against it in this Ryder Cup, he knows he's going to be the man with the "X" on his back; the American players will relish playing against him. "But if anyone is ready for that challenge it'll be Ian Poulter," the captain added. Westwood will be playing his ninth Ryder Cup, adding to an extraordinary unbroken run that stretches back to 1997. Despite showing recent "green shoots" of recovery, he has also been picked in the hope that his largely patchy form is temporary and underlying class has more permanence. Again he will be under pressure to deliver on his captain's faith. Two years ago the former world number one was woefully out of sorts until he clinched a vital singles point against Matt Kuchar. Regarding the American picks, it was a similar story for Watson with two relatively straightforward selections and one that was more contentious. Keegan Bradley is the United States version of Poulter and potentially the heartbeat of the team. He is likely to get the best from partner Phil Mickelson and his overt quest for a spot showed the kind of Ryder Cup desire we more readily associate with European players. Victory at the Barclays for Hunter Mahan a couple of weeks ago duly ensured a return to the team for a classy golfer who will be making his third appearance. Like Bradley, he will carry a burning desire for redemption. After a duffed chip on the damp turf of Celtic Manor, a tearful Mahan fell victim to Graeme McDowell in the decisive match in 2010. The 32-year-old Californian joins seven survivors from two years ago when the USA let slip a 10-4 lead to lose by a single point. He fits the profile of player to carry out Watson's stated aim to "go back and make amends for what happened in Medinah two years ago". That also helps to explain handing a wildcard to another veteran of that Chicago capitulation, Webb Simpson, who will presumably renew his partnership with Masters champion Bubba Watson. The third American pick was tough to call - play-offs leader Chris Kirk and Ryan Moore can count themselves unlucky. The captain clearly didn't want to add to his list of three rookies. Brandt Snedeker was in a similar boat to Luke Donald, his long game not quite matching up to a stellar putting stroke. Both line-ups look well balanced. America will miss Dustin Johnson, who was unbeaten two years ago but is currently taking a break from the game, but are less likely to feel the absence of Woods. They have the makings of a side that could gel in the way Europe used to, with fewer superstars, but a rump of consistent players who aren't short of recent form. Eight of the top 15 in world ranking points gained this year are in Watson's team. As for Europe, only Rory McIlroy (first), Sergio Garcia (third) and Justin Rose (eighth) feature on that list. Yet with home advantage and seven wins in the past nine Ryder Cups, Europe justify their shorter odds. "To be in a situation where we are favourites is something to embrace, something to be proud of," McGinley said. "[We have] the number one player in the world in Rory McIlroy, Martin Kaymer winning the US Open and Justin Rose winning the US Open last year, and on and on. "But we are under no illusions whatsoever how difficult this is going to be. Anyone who follows Gaelic football [knows] Dublin were 1/7 favourites to beat Donegal last weekend and lost by four points. "So the favourites tag is great but it's also something that we're very wary of. We are up against some opponents who will rally and galvanise themselves as underdogs." 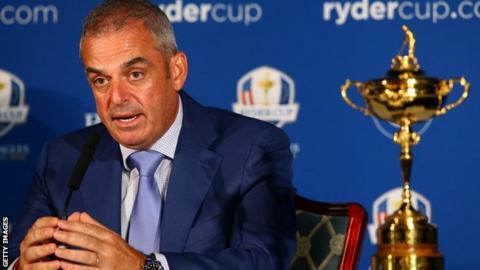 Wise words from a captain who knows this Ryder Cup is anything but a foregone conclusion.